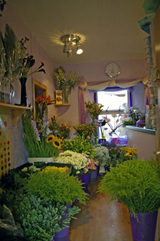 We provide a friendly reliable Flower Delivery throughout Edinburgh and the Lothians. Floral displays are all designed to customers specification: for hotels, restaurants, shops, offices and other businesses. We are a blossoming family run business based in the heart of Edinburgh area, we cater for all your floral needs in Edinburgh, and beyond. With a real passion for flowers and an eye for the unusual, Moira will create a unique floral design to compliment your event or occasion. Be it a Wedding, Birthday, Anniversary, Corporate Event, Valentines Day, Mothers Day or just to say thank you, Moira will create the perfect arrangement just for you. * Chinese New Year and other religious and cultural festivals. Floral displays are designed to customers specification: for hotels, restaurants, shops, offices and other businesses. From Weddings, Bloomin' Magic provide a full range of wedding flowers, buttonholes, corsages, table centrepieces and pedestal arrangements. We also design and make our own range of wedding favours, making sure that everything goes to plan on your big day. To, Funerals are professionally and respectfully catered for, with wreaths, floral letters and cross tributes, sympathy pillows and casket sprays all available to order.